Inspired by Auguste Rodin? Very likely. 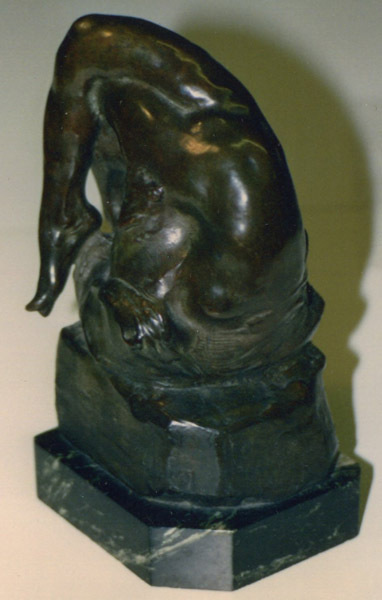 Frederick Warren Allen was studying and sculpting in Paris in 1914 when Rodin was still alive (1840-1917). He spent many hours drawing in the museum galleries, taking special note of the new modern sculpture being shown there, especially at the Luxembourg Museum where Rodin was on exhibit. Before his death in 1917, Rodin was changing the way figurative sculpture was traditionally done and with much criticism, introducing a new artistic expression with his work. Modern? Certainly, and that appealed to the young and inspired artist in Allen. A photo showing him lounging in his Paris apartment with his new bride displays a drawing of The Thinker pinned on the wall behind them. (A humorous side note here, he made a pencil drawing of Rodin’s masterpiece on the lid of his camp outhouse in New Hampshire which the family all thought hilarious.) Look at images of Rodin’s Oceanides and Sirens and you can see the inspiration of the female bodies emerging from the waves. Andromeda, from Greek mythology, who was rescued from the sea, has the same shape and a similar connection to the water. Allen was surely inspired by Rodin, but also by the ocean. His diary mentions the strong pull he felt to the “out-of-doors Maine life” as early as 1913. The next summer, the year The Wave was finished, he agreed to purchase the North Haven property on Bartlett’s Harbor in Maine where the North Haven Artists Colony grew. This beautiful spot is enjoyed by his family to this day. The Wave is an imaginative study, fusing a woman’s body with the curve of a wave as it comes toward shore. She arches backward, her head disappearing into the water, her relaxed legs crossed and enjoying the force of the water as it streams against her and pulls her under. The plane of the body is angled sharply into the wave into which it dives. The crossed lower limbs create an additional asymmetry in the form, making it interesting viewed from all sides. The mass is in movement yet balanced on a rock atop a marble base, cohesive in its whole. Details of the superbly modeled torso and legs show his traditional disciplined Boston School training, while a modern textural element and emotion is created with the moving water. The Wave is owned by the Farnsworth Museum in Rockland, Maine across the harbor from North Haven, the gift of Agnes Allen and a fitting placement for the ocean-themed sculpture. Frederick Warren Allen is among the sculptors we’re including in our forthcoming exhibition, Rodin & America. We’re displaying his “Torso” from the Museum of Fine Arts, Boston. I’m hoping you can provide a portrait of the sculptor as we’re hoping to illustrate the checklist for the exhibition with thumbnail portraits of the artists. That’s exciting. I have other information and images of sculptures that show a comparison between Allen and Rodin. I would be delighted to provide you with scans of portraits from which to choose. I recently had cast a posthumous bronze copy of his self-portrait bust. It will be on exhibit in North Haven Maine at the Bartlett’s Harbor Artists’ Colony exhibit all summer. I have the original plaster which I would be willing to loan. I just discovered the location of his “Cain and his Conscience” which was on exhibit in the Guild of Boston Artists traveling show in 1915 which is definitely Rodin style. You might also contact Concord Art Museum about his Nydia and Farnsworth Museum about The Wave. There is a late sculpture called The Fisherman that he created for the summer exhibit of the North Haven Art Association that has a similar feel to Rodin – details subordinate to the physical and emotional power of the piece. It will also be on display this summer in Maine. I could send you an image.